If you asked me what my most anticipated movie of November 2018 was, I would’ve answered <Default>. And after watching the film, I stand by my claim. The month of November was filled with releases of Korean films. Although not all seemed to be good (and definitely not all were), <Default> was amongst my top list of movies to watch, and this was not only limited to November but the whole second half of 2018. I had the awesome opportunity to attend a prescreening and cast meetup, and I was thoroughly satisfied. Directed by Choi Gook-Hee, who also directed <Split>, the film features a phenomenal cast, both main and supporting. The lead actress, who plays a determined, diligent, and ethical character, was performed by Kim Hye-Soo, a veteran in the Korean movie scene. Furthermore, the male main cast were also amazing, including Yoo Ah-In, Huh Jun-Ho, Jo Woo-Jin, and the French actor Vincent Cassel. Unlike many films where if the main cast are amazing, the supporting isn’t as great, <Default> had an outstanding supporting cast as well, including Park Jin-Ju, Kwon Hae-Hyo, Cho Han-Cheul, and Kim Hong-Pa to name a few. <Default>, which the literal translation from the Korean title is “The Day of Sovereign Default,” goes over the economic events that took place in the late 90s in South Korea, which ultimately changed the fates of Koreans for years to come. The aftermath of the crisis is still felt by many today, and resonates clearly in the minds of numerous Koreans. The hardships of small-to-medium sized companies as well as chaebols (Korean conglomerates), the political atmosphere of the Korean government, the Korean economy and its entrance as an OECD member prior to the crisis, and most importantly, the IMF bailout Korea received, are all covered in the film. 1997, a time where the South Korean economy was believed to be booming, nobody foresaw what the next few weeks would bring onto the country. That is, except the Bank of Korea’s Monetary Policy Team Leader, Han Si-Hyun (Kim Hye-Soo), and financial adviser Yoon Jung-Hak (Yoo Ah-In). Once Han Si-Hyun detects a crisis around the corner, she reports the information to her superiors, but the government doesn’t think too much of it, until it’s too late. Grasping the fact that there’s a huge disaster approaching, the government sets up a “Crisis Control Team,” without letting the public know of the situation. Meanwhile, Yoon Jung-Hak reads the several signs of the crisis approaching, and decides to quit his job and invest in the sovereign default of S.Korea. On the other end, Kab-Soo (Huh Jun-Ho), an average factory owner who knows nothing of what’s coming, signs a bill transaction contract with a large-scale department store hoping to grow his business. The time till sovereign default is forecasted as one week. 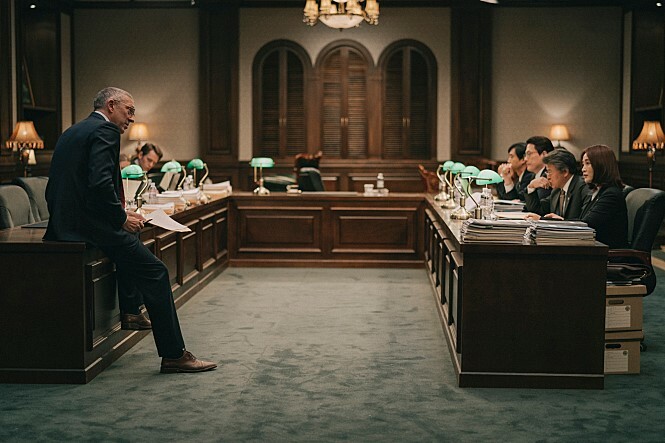 As the Crisis Control Team plans a strategy to recover the economy, the state’s treasurer (Jo Woo-Jin), goes against the advice of Han and proceeds with negotiations with the IMF GM (Vincent Cassel). A story of the one trying to stop the crisis, the one betting for the crisis, and the one trying to protect his company and family amidst the crisis. Turn back the clock to 1997; a time of the biggest dilemma of modern South Korean history. First off, as mentioned before, the cast (both main and supporting) were amazing. Not only are they well known, but their performances were incredible, proving why they have their high positions in the K-Entertainment industry. 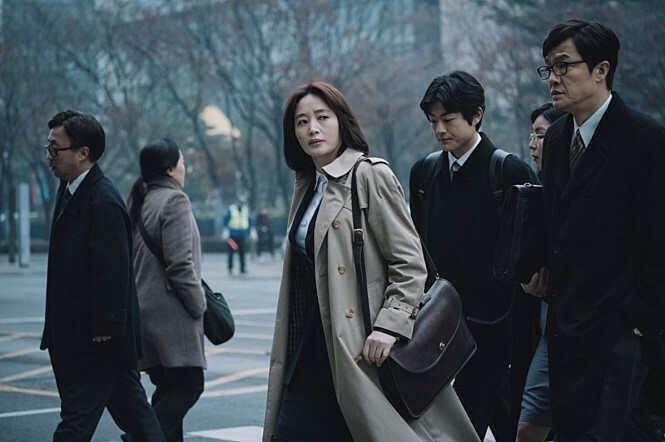 Kim Hye-Soo was outstanding in portraying the Bank of Korea agent, really engaging the audience and making sure the viewers understand the importance of the situation. I feel like her acting just gets better and better with every production she’s in. From <Tazza: The High Rollers> to <The Thieves>, and now <Default>, she truly shows her potential and range in acting capabilities. In addition, Huh Jun-Ho, whom I believe has the longest history in the industry of the cast members, was also chosen perfectly for the role, and did very well in portraying the “average” Korean of the time. His acting really immerses the audience back to the late 90s, and makes the audience reminisce and empathize with what the Korean people had to go through. Moreover, the acting by Vincent Cassel was also carried out extremely well. I usually complain that when foreigners are featured on Korean movies, they really can’t act… However, that is not the case with <Default>. 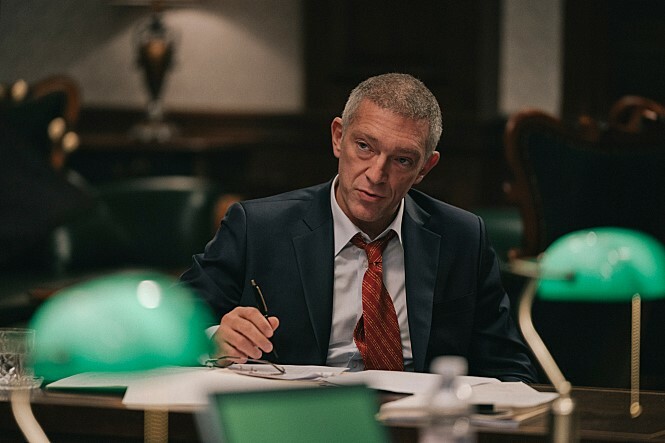 Vincent Cassel, who’s already proved his skills in non-Korean films, was a very natural fit for the role, and his appearance in a Korean movie surprised many. In addition, another point I complain about is that the English spoken by the Korean actors is horrible in majority of Kfilms, but with <Default>, the English was actually pretty good. It was mostly understandable even without subtitles. Due to the length of the review, I won’t mention other actors and actresses, but just know that the cast was awesome in this! (One last note, the role portrayed by Jo Woo-Jin really makes you despise the treasurer’s character, in a good way). The story itself was a great learning lesson, both for the people that went through the crisis, and the younger generation that weren’t yet old enough to understand what was going on. For the older generation, the film was a good reminder of what took place, and several lessons can be taken for future decisions of the state. As for the younger ones, the movie remarkably depicted what our parents and grandparents had to go through during this time in Korea. The narrative is one that both the old and young could enjoy. It also goes over some modern issues that Korea is still facing, such as sexism, and even mentions that some problems are still being dealt with to this day. And although the overall story is a very heartbreaking and somewhat a depressing one, it has sprinkles of humor throughout its duration to keep it from going too dark. On the cinematography end, I personally thought the movie was very well shot. The film had a great balance of audio and silence, giving significance where needed, and also an impressive balance of that “90s style” blended well with the modern film style. The movie, although I said it was good for both the young and old, isn’t for everyone, though. You should at least have some interest in Korea and its history, and basic understanding of economics. Because the film is based on the economic crisis of South Korea, there are a lot of financial and economic terms thrown around. I suggest if you do not have sufficient knowledge on these matters, to at least look up what “IMF (International Monetary Fund)” is. But the movie does a great job in explaining the situation so as long as you do understand basic economics, I don’t think you’ll have too hard of a time comprehending the film. Finally, the movie isn’t a fast-paced one. It doesn’t have lots of action or a lively tone. But this does not mean that it has a slow progression either. I personally think it was well-paced for my taste, but for some, it may get a little dull. <Default> was a very real movie with a compelling story. The fact that it was based on true events made it that much more engaging and enjoyable. Not only this, but it had a good message and several lessons to learn from. I can’t imagine how emotionally connecting it must be for our parent’s generation that actually went through the crisis. A definite watch I recommend!